• Kitchener, ON, Canada : Andrew Wright, Ian Newton, Mary Catherine Newcomb •	Berlin, Germany : Laura Bruce, Irma-Kinga Stelmach, Lena Zeise •	Produced with the assistance of: Contemporary Art Forum, Kitchener, ON, Canada; Ed Video, Guelph, ON,Canada; Nathan Saliwonchyk (editor), Kathrin Becker, Vanessa Ohlraun (Cultural Officer, Canadian Embassy in Berlin). 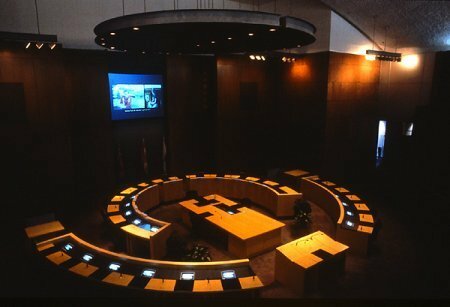 Site-specific video project for the council chambers, projected simultaneously on a large screen and on thirty monitors embedded into the architecture of the space. The project acts as a mediated dialogue between three artists from Kitchener, Ontario, Canada, and three artists from Berlin, Germany. Prior to 1916, the city of Kitchener was known as Berlin. In both Kitchener and Berlin, local artists act as 'guides', choosing a site of particular significance to them and recounting a story in their mother tongue. The artists also act as 'interpreters' by responding to the videos in the other language with a simultaneous written translation based either on their knowledge of the other language or by creative guessing. The written 'translations' appear as subtitles. The project attempts to position relationships between people and places, like communication, as a fluid, ongoing process of translation, interpretation and mediation. Event: Contemporary Art Forum Kitchener and Area, Kitchener, ON.